The problem with Newtonian telescopes is that they have an on-axis secondary mirror which obstructs the view of the main mirror. The Digges-Bourne perspective glass does not use a secondary mirror at all and employs a tilted mirror. Telescopes with tilted mirrors are termed off axis telescopes and there have been many designs over the years. Sir William Herschel used an off axis reflector in the late 18th early 19th century. In 1789 he constructed a huge 49.5" diameter telescope using this principle. In Sir William's opinion the disadvantages of spherical aberration outweighed the disadvantages of a secondary mirror blocking the view and also secondary mirrors were prone to tarnishing which reduced the reflected light. The figure below is courtesy of Wikipedia. Just like the Digges-Bourne perspective glass the observer faces backwards. 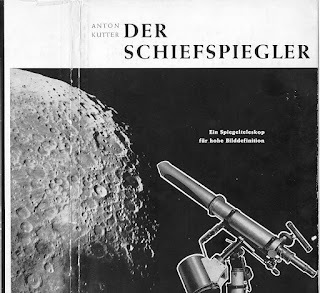 Off axis telescopes have never been very popular with astronomers but in the 20th Century the German scientist Anton Kutter revisited the design and invented Der Schiefspiegler (tilted mirror) telescope which used an off axis secondary mirror so that the observer now looks forwards. The Schefspiegler uses a concave primary mirror and a convex secondary mirror to minimise spherical aberration. We know that in Shakespeare's times glass lenses were often of poor quality but there were excellent concave and convex mirrors available made from Murano glass. An example of such a convex mirror can be seen in the painting of the Arnolfini Wedding by van Eyck (ibid 12th November 2017). It occurred to me that using a second mirror and rearranging the optics slightly the Digges-Bourne perspective glass could be greatly improved. Of course no one ever thought to do this in Shakespeare's time but the necessary optical components were all available and Thomas Digges would have had access to them from John Dee's collection. Della Porta's treatise on optics (De Refractionione Optices) provides all the necessary theory so I thought I would have a go to see what could be achieved and I will post the results here.